A genetic engineering student discovers that a circus worker is a descendant of the legendary Bhodi Dharma, who lived during the 6th Century AD. The student believes that a person's DNA contains the genetic memory of their ancestors, and thus the circus worker could be trained to equal his legendary ancestor. When China learns of this, they send an agent to make sure that the theory, and its realisation, never happen. In Tamil language with English subtitles. Also released this week: The ReunionSkeemRA. 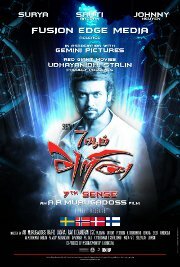 One (3D)State of Violence7 Aum Arivu30 Minutes or LessIn TimeHoodwinked Too! (3D)Hoodwinked Too!